Happy birthday to Pretty Pink Posh! From January 14-16 the celebration goes on…and I’m blessed to be part of day one. Thank you Paulina for sharing these fun goodies with me to use! I thought the cute little clouds would be perfect for coloring rain…the weather has been inspiring for this kind of thing lately, don’t you think? Right now I’m in San Francisco at the Periscope Summit (follow along HERE) and it’s a rainy dreary forecast for the whole time we’re here! Clean Color pens are a great medium to use for things that are all wishywashy like clouds and rain, too – so be sure to get yours out and color along. Watch the video below or watch HERE in HD on YouTube. The angry little cloud face is perfect for a rainy cloud – we usually put smiley faces on everything but I kinda like his sad face in this case! The little shaker card, made with the Fuse to seal in those tiny stars, is a shiny little card – and the frame dies? Oh boy. Just think of all the tiny images in your stamp collection that can be peeking through! The whole set of dies gets smaller and smaller, so tiny photo frames are gonna be so much fun! And lastly, an odd-sized card to use up some odd-sized envelopes in my stash. I used the same rain technique on this one, but upside down! Be sure to check out the whole bloghop – there are coupon codes and bonus goodies when you purchase from the Pretty Pink Posh site, and prizes and giveaways on their blog too – yay! It’s a party!! Below are links to the supplies I’ve used for today’s project; click on the listed items to go directly to it. Affiliate links are used, which means if you make a purchase I receive a small commission at no extra cost to you. I truly appreciate your support toward the costs of running this blog! Read more. These card have such a different style. Thanks for sharing. What a great card! I can think of so many times I would have like to have a card like this to give to a friend! Thanks for sharing! Beautiful , love your coloring. It’s fabulous as always, love that angry cloud guy!! Such inspiring cards! Thanks for the video – I learned several things about the brush pens that I am looking forward to trying! 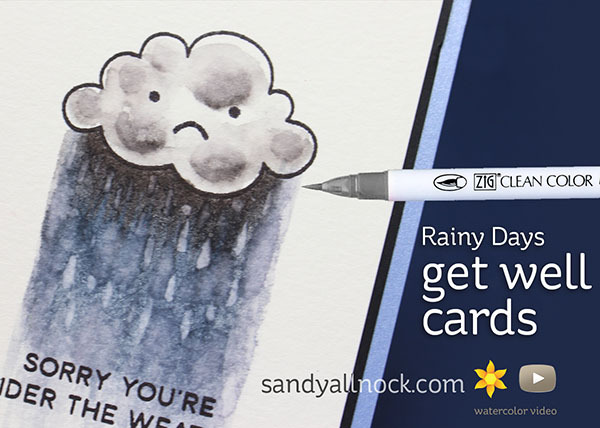 You’re right that we rarely see sad-faced clouds, Sandy, but all three of your cards are sure to brighten someone’s day. Great work.